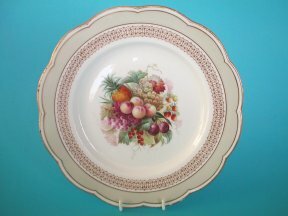 A First Period Worcester Reticulated Dessert Dish. c.1775. A rare pieced Worcester square dessert dish. Pierced English Creamware from Leeds and other centres seems to have been the inspiration for these rare Worcester pieces. 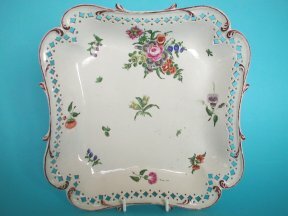 Strangely most examples of this tricky and presumably expensive technique seem to have been decorated with cheaper blue transfer prints or simple enameling This dish with it's typically well painted, Worcester factory interpretation of Chelsea / Meissen flowers, must be quite rare. The dish measures. 22.5cm. x 22cm. across and 4cm. high. There are no factory marks. Good, the only slight damage being a tiny glaze chip to the end of one of the edge scrolls. There is a small amount of enamel loss, mainly to the rim. 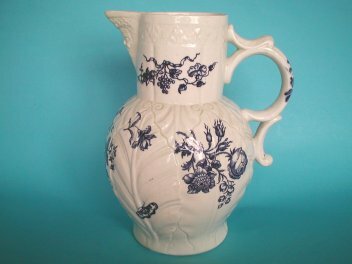 An exceptionally large Worcester 'Cabbage leaf' jug. 30.4cm. high and about 64cm. in circumference. It is transfer printed with the 'Pinecone' and other floral and Butterfly prints. The prints are particularly clear for this type of ware, probably due to the size of the piece! A Rare Coalport ? Basket. c.1825-40. 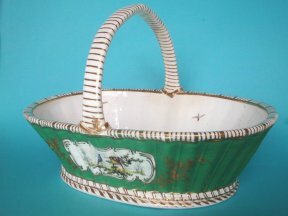 A unusual English Bone China oval basket. Probably made at Coalport in Shropshire in the second quarter of the 19th.Century. Moulded to the exterior with basketweave, obviously simulating a wicker basket. Finely painted in Sevres style with a green ground reserving panels of exotic birds to either side. The reserves with fine raised paste, tooled gilding to each side. The interior with birds in flight ( some enamel wear). The basked measures a generous 32cm. long. 22cm. wide and also 22cm. high to the top of the handle. No factory marks or pattern number. An unusual and very rare item!. Good, with very little post manufacture damage. The piece has several firing cracks, some disguised with gilding. There is also a crack to the base which also probably originates from it's firing. Thickly potted pieces of early bone china were very susceptible to firing cracks (shrinkage cracks ). The decoration is in very good condition on the outside, but some of the small painted birds on the inside are badly worn. An English Bone China plate c.1870. Possibly made by Copeland? Very well painted with fruit. The plate measures 23.5cm. diameter and is unmarked. A couple small faults to the gilded rim and a small amount wear to the enamels.